The Seaboard Rise is a keyboard / MIDI Controller unlike any others… A modern “touch” controller, a great design and a truly innovative concept behind this new product. MIDI over bluetooth, battery powered, light and thick, touch faders and XY pad, a custom built-in synthesizer… Comes with a protective case… The ROLI Seaboard Rise is a high end product made for everyone. The multidimensional Seaboard RISE lets you control sound through five dimensions of touch. 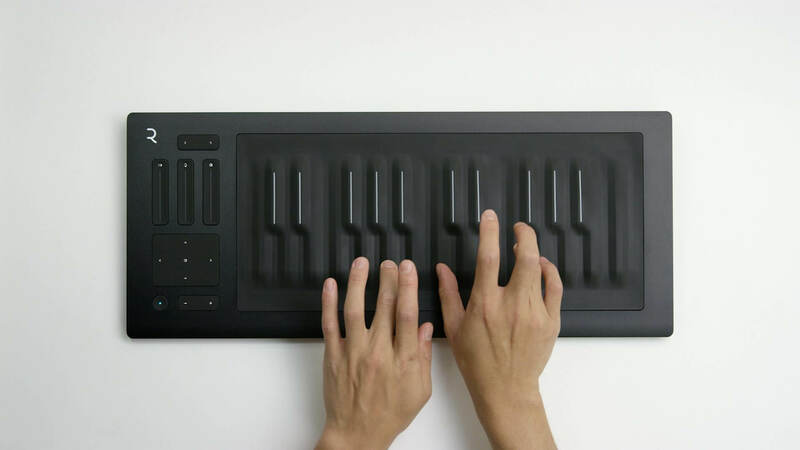 It moves far beyond the expressive limitations of a standard keyboard, opening up new ways to make and shape music through intuitive gestures. The Seaboard RISE’s five dimensions of touch are easily mapped and can be controlled directly from its unique touch faders. Adding another layer of expressive control, three Touch​ F​aders let you tune the touch responsiveness of the keywaves in real time. Adjust the sensitivity of the keywave surface to touch – and modify the expressive qualities of your music – to suit your personal style and particular sounds. Compatible with a variety of software and hardware synthesisers, as well as DAWs across OSX, Windows, and other platforms.